Warming, hearty and with mountains of flavour, this basic recipe for a quick and easy noodle soup is a must if you’re in a rush. Strictly speaking, if I had a good amount of time on my hands I would definitely make the beef stock from scratch using beef bones but I’ve no problem using stock cubes. Place your stripped beef into a bowl along with the chopped spring onions, garlic, soy and sesame and turn the meat in the mix to coat. Cover and leave to marinate in the fridge for at least 30 minutes (I usually pop it in for an hour if I’ve the time). Pop your egg noodles and a pinch of salt into a saucepan of boiling water until cooked. Drain, then set aside. Place your beef stock in a pan and bring to a boil. Add the marinade and the beef into the pot of stock, along with the broccoli, baby corn and shredded leek. Drop down to a simmer and leave to cook for about 8 minutes until the vegetables are tender (keep an eye on your beef to make sure it doesn’t overcook!). You can add the chili powder at this point for heat. Finally, add in your noodles to the broth to reheat and serve. Note: You can of course vary the vegetables with this recipe – I love throwing in green beans when they’re in season. When I hear the word “spicy”, I instantly know that it’s something I’m going to avoid, but when it comes to using more fragrant and flavoursome spices, it’s a big thumbs up from me. This buttery chicken masala is one of those recipes where I get to throw in a dash of this and sprinkling of that, and it never seems to go wrong (famous last words!). It’s a quick meal to rustle up and when you rattle off what went into it, instead of tossing in a pre-made packet, I’m sure guests will be impressed. I know the long list of ingredients might look a bit terrifying but believe me when I say this recipe is remarkably straightforward. Optional: 1 tsp or more of chili powder if you’re in the mood for something more spicy! Prepare your ingredients. Heat and melt the butter in a large pan, and then add in your onions to cook until golden brown. This should take about 10 minutes on a medium-to-high heat. When the onions have coloured, add in the garlic, ginger, ground coriander, curry powder, turmeric and a teaspoon of salt (with the optional chili powder). Sauté the spices in with the onion or a minute until the aroma becomes fragrant. Add your tomato purée into the mixture along with the diced tomatoes and cook until slightly thickened. Now to add in your milk! To make sure it doesn’t curdle, I always scoop some of the hot mixture in with the milk and stir it around to heat it slightly. Then I pour it into the pan along with the chicken breast pieces. Cook your chicken on a medium heat for about 10 minutes until soft but cooked through. While the chicken is cooking, you can put on your rice so that it’ll be ready on time. Don’t worry, you’re almost done – it’s finally time to stir in the yoghurt! Make sure it’s well incorporated into the chicken masala and then quickly chop up a handful of coriander and stir through. Serve on hot plates on top of your rice with another sprinkling of coriander on top and ENJOY! A super easy breakfast that’s a tasty alternative to the traditional cereal, avocado on toast is a great treat. What’s great about this basic recipe is that you can always add your own variations to it. The most important ingredient is the avocado, and it must be ripe or it won’t mash and spread properly! Cut the avocado in half, remove the pit and scoop out the avocado flesh. Place into a bowl. Add the lemon juice and a sprinkling of nori flakes to taste and mash together with a fork. Keep the texture slightly chunky. Pop your slices of bread into a toaster, and when they’re ready divide the avocado mix onto the slices and spread. Drizzle some extra-virgin olive onto the top and enjoy! Note: If you’re feeling a bit more adventurous, you can add chili flakes to the avocado mix , switch the lemon for a lime or even add a fried egg on top. It’s only in the past few years that I’ve discovered the delicious wonder that is polenta. Polenta is a maize porridge whose name derives from the Latin for hulled or crushed grain. Yellow in colour, the end result often has a soft texture and is gloopy-like, but don’t let this description put you off. With a little love and a mixture of ingredients, you can come up with something that is quite filling and very enjoyable. Here’s a take on this ingredient with added curry and cheese (don’t worry, if you can’t stand the heat, this is incredibly mild). I promise that it doesn’t taste like gruel! Bring the water to the boil in a medium saucepan then add a teaspoon of salt. Add in your polenta steadily with a whisk and continue to stir in until it thickens. Turn your heat down to low and cook for about 40 minutes. Unfortunately you have to keep an eye on it, so I would recommend stirring or whisking every 10 minutes. If it starts to look a bit clumpy, simply add a dash of water and stir quickly to loosen it up. After 40 minutes or it looks swollen and doesn’t taste raw, stir in your Parmesan and curry powder. Take off the heat. At this point you can choose to firm up your polenta by cooling, but I often prefer to eat it out of a bowl like rice pudding! To firm the polenta, lightly butter a baking sheet or some sort of shallow dish and pour in your polenta. With a spatula, spread it evenly and leave it to cool at room temperature. This will make your polenta easy to cut into shapes for deep frying or baking. This afternoon and like most weekends, it got to that time of day where I was staring at my cupboard and wondering what I could come up with, with random ingredients. Since attending Ballymaloe Cookery School, I’ve had a mild obsession with this nifty spice, and so it only was natural that I would team it with something else I loved: decent, luxurious, chocolate! I’m pretty sure we all have a favourite cup for tea or hot chocolate, so when I say one cup of milk here, I mean as much as you can fit in your average cuppa. Let me know if you give this a go – I really enjoyed tasting it! Tip all of your ingredients into a small pot and place under a medium-low heat – this is pretty important because you don’t want any of your milk to burn. If you bring your milk to a boil it will form a skin. Keep whisking throughout the entire process and make sure that all of the chocolate melts and incorporates itself into the milk. Stir until smooth. Remove from the heat and sieve the drink into your cup to remove the cardamom seeds. *If you only have powdered chocolate, just use two heaped spoonfuls of that. Use chocolate that you can afford! In a bid to launch myself more into the baking realm (maybe there is a such a thing), I decided to tackle the sweeter side of life. This recipe for cookie dough is very simple and what’s great is that it can be the base for a variety of biscuits if you just take out the chocolate chips. Place your softened butter and caster sugar into a large bowl and combine well with a wooden spoon. Add in your egg and vanilla extract and beat together briefly to combine. Slowly add in your plain flour with the pinch of cinnamon and chocolate chips and mix into a dough. At this stage I like to use my hands to form the dough (You can refrigerate the dough at this stage if you don’t plan on cooking it or be a bit bold and eat it raw!). Flatten out into basic circular cookie shapes using your hands and using a cutter, shape into whatever style you’d like! Bake for 15 minutes and leave to cool on a wire rack. Right now I’m in the process of cutting back on all of the sweet and indulgent things that I shovelled in over Christmas. These bars have a nice sweetness to them, without being overpowering and a little square will keep you nice and full. With a combination of flavours including coconut and peanut butter – who needs chocolate? What’s nice about this recipe too is that you can really vary the types of nuts and seeds you throw into it. Don’t like figs? Try dried apricots or raisins! Don’t like Brazil nuts – add in some sesame seeds. Place Brazil nuts, cashews, almonds and sunflower seeds into a food processor and blitz until they’re finely chopped. Add them into a bowl with your dried fruit, desiccated coconut, pumpkin seeds and a pinch of the sea salt. Stir the mixture well. Melt the coconut oil in a saucepan and once it’s melted take off the heat and stir in the agave syrup, vanilla extract and peanut butter. Mix well in the saucepan using a whisk or a fork. Pour the wet mix over the dry in the bowl, and stir together until all of it is coated. Transfer the mixture into a parchment-lined tray or dish and press down with a spoon. Put into the fridge for about 2 – 3 hours before you take out and slice! But if you’re in a hurry you can always nibble sooner. Whenever I’m on the hunt for a quick bite to eat, I look for a meal that can be easily prepared and served up onto the plate under an hour. 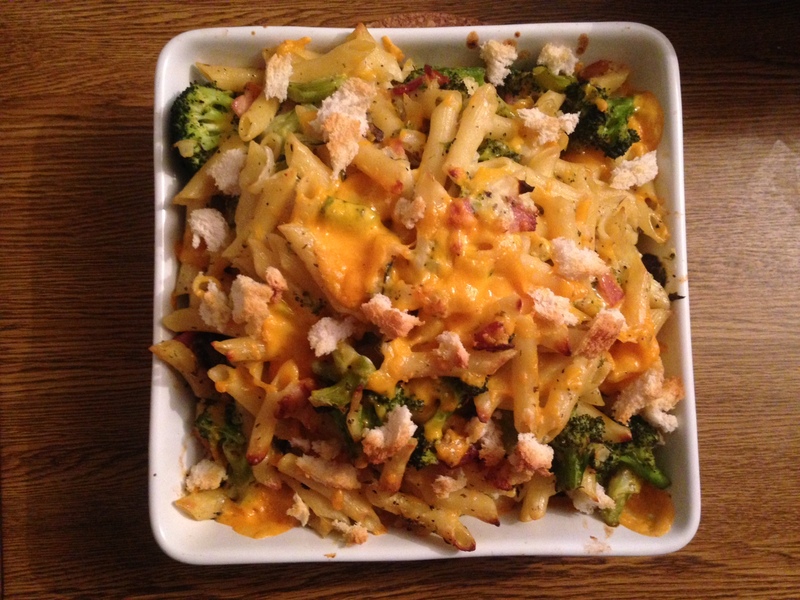 Presenting: the broccoli pasta and bacon bake that’s a whizz to put together and tastes pretty good too! It’s definitely one of those dishes that you can keep on adapting again and again by changing up the bread toppings and cheeses, to different styles of pasta. Take out the bacon and switch to a vegetable stock cube if you want to make it vegetarian – or instead of broccoli you could use cauliflower or a mix of both. You can be as creative or as simple as you like. Recipe is adapted from BBC GoodFood. Note: You need a big pot for this and you will also be using a frying pan and grill. Prepare your pasta, onion and broccoli stalks by popping them into a large pan and covering in salted boiling water. Cook according to packet and until pasta is soft. While that’s on the go, in a small frying pan with a tiny bit of oil, cook your bacon lardons on a high heat until crispy. When the pasta is close to being ready, add in the broccoli florets and keep cooking for a further 3 minutes. Drain the pasta and vegetables and set aside but remember to reserve about 450mls of the cooking water. Mix the bacon in with your drained pasta and vegetables. Add the reserved water back into the pot and stir in your stock cube until thoroughly mixed. Add in the mustard and crème fraîche and then whisk into the liquid. Bring it to the boil and then add in your pasta, vegetables and bacon. At this point you also add in half of the cheese mixture. Season to taste with salt and pepper. Heat up your grill. Chop up your parsley and it in – the sauce surrounding the pasta and other ingredients should be like white sauce and thick. Pour your mix into an ovenproof dish. Mix the the breadcrumbs with the dried thyme and oregano and sprinkle on top of the dish with the remaining cheese on top. It’s grill time! Pop the dish underneath and give the bake less than 5 minutes under heat. You’re waiting for the top to brown but not burn. The bread should be nice and toasty too with a bit of colour. Gnocchi is such a wonderful little alternative to the traditional spud and combining it with a bit of butter and garlic can be a simple treat. 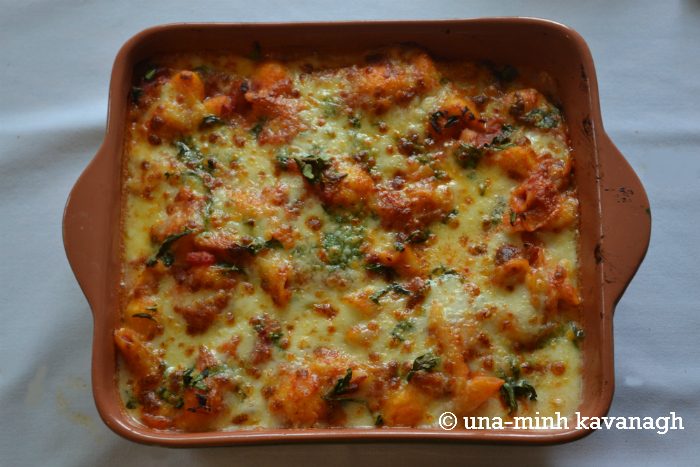 Over the past while I’ve been experimenting with gnocchi recipes and have come up with a bake that doesn’t take a a lot of time and uses ingredients you can find in all supermarkets. I haven’t gotten around to making my own homemade gnocchi as of yet but I’ve heard that it’s easy enough to do so I’m looking forward to learning. 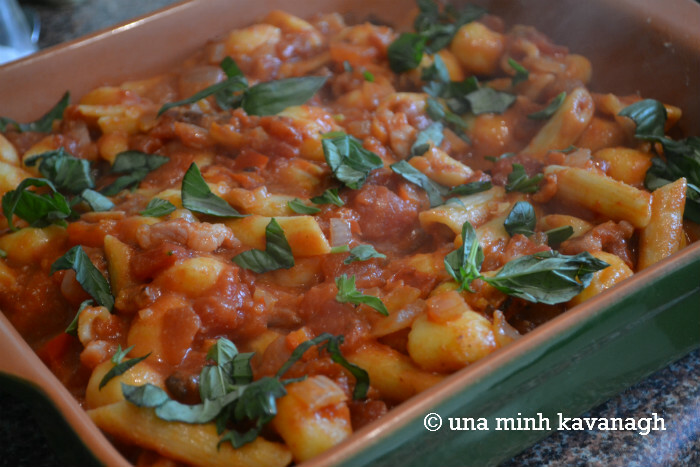 Here’s my recipe for a gnocchi bake – with the option of making it vegetarian by not adding the bacon lardons! Add in your garlic and fry for a further minute then add in the chopped tomatoes and gnocchi. In the meantime, turn on your grill to high and take out an oven proof dish. 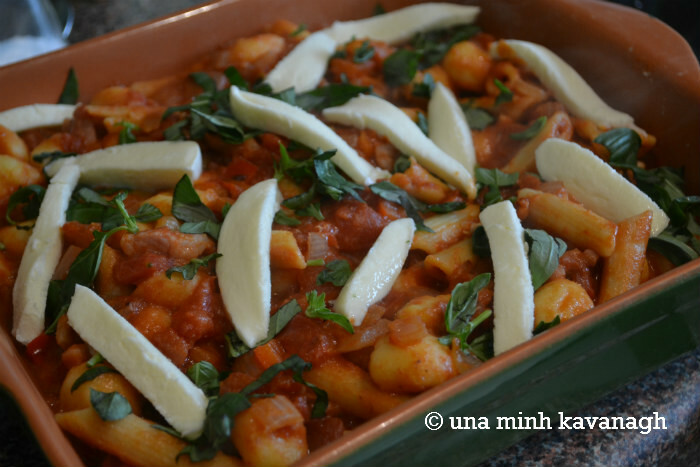 After the gnocchi is cooked, season, stir through the basil and then transfer to the ovenproof dish. 6. Chop up your mozzarella into strips and lay across the top of the dish. Grill for 5 minutes until the cheese is bubbling and has a golden look to it. Serve with a fresh salad or on its own. 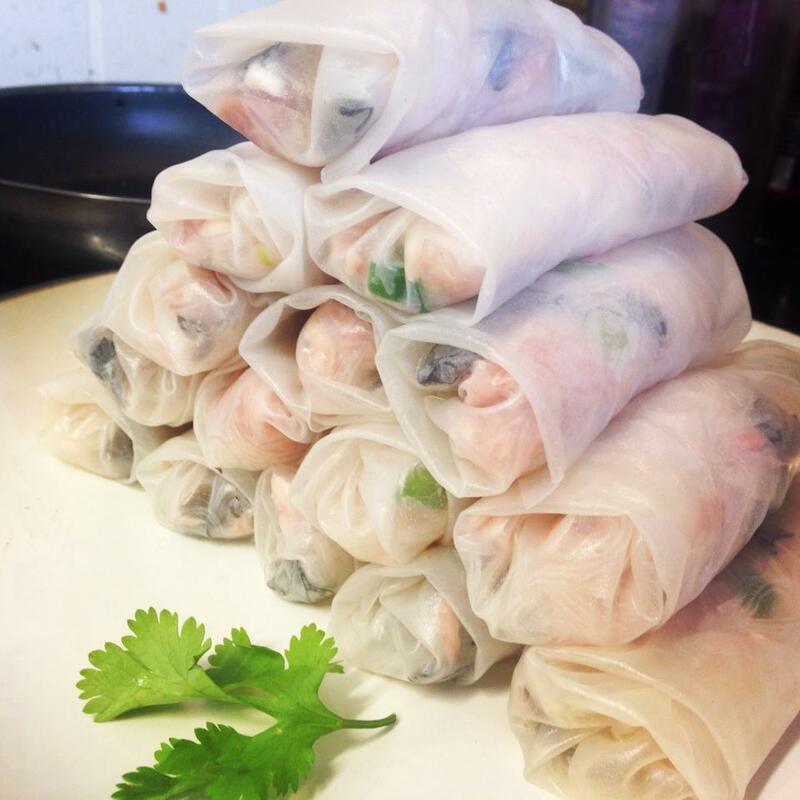 There are many types of spring rolls in Vietnam, but the ones I’ve always adored are “Nem Ran”, which are the most popular rolls in the north. Though they can take some time to put together, the end result is a really crispy roll that’s jam-packed full of goodies. 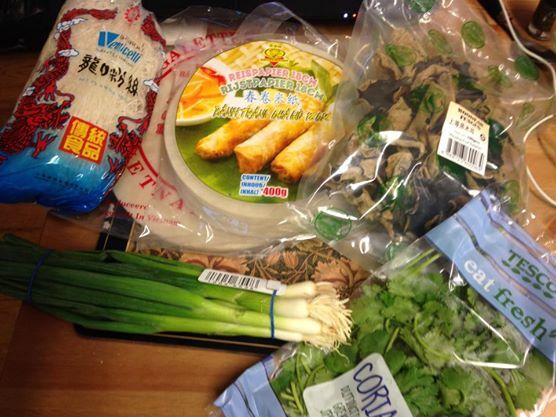 If you’re not sure where to head to buy supplies, you can find the ingredients in most Asian food stores – I know that recently Tesco have been stocking wood ear mushrooms and they have white crab meat too. 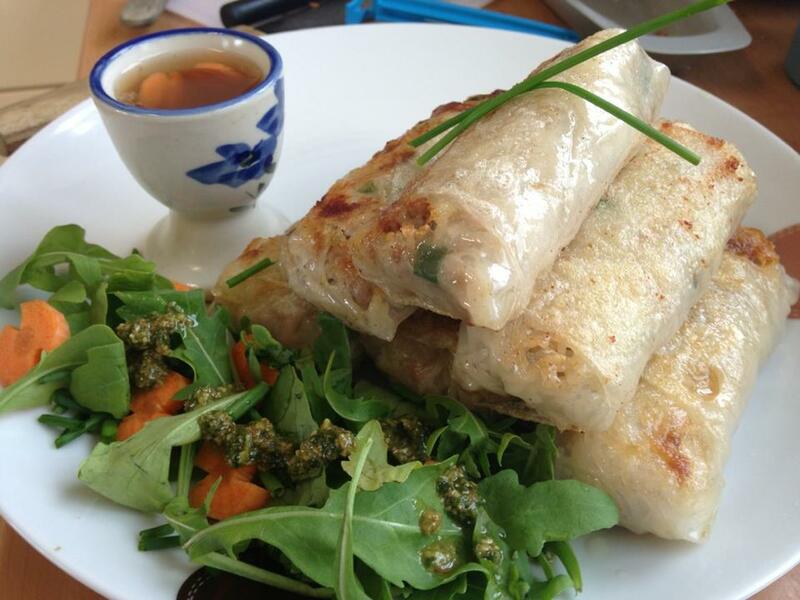 Here’s my recipe for homemade spring rolls and their traditional dipping sauce Nuoc Cham – good luck! 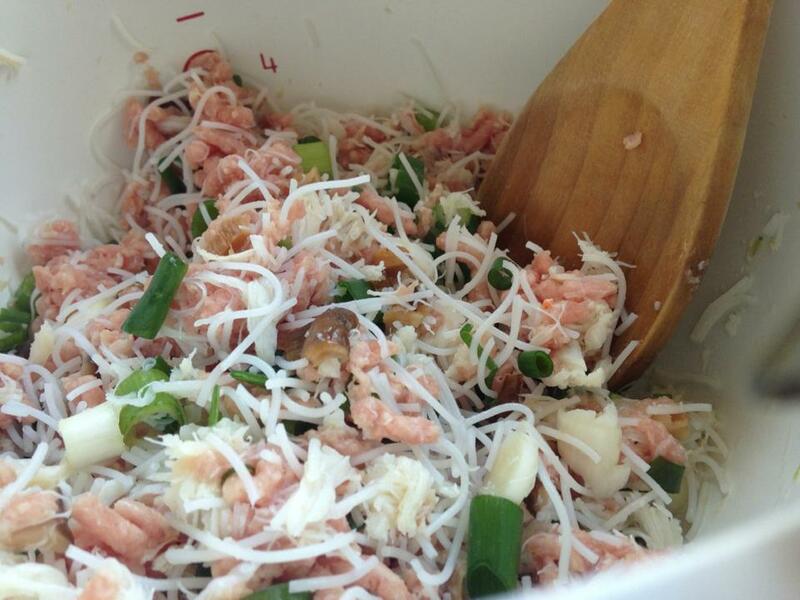 Combine the pork, crab meat, wood ear mushrooms and spring onions in a bowl. Drain your noodles well and then chop them finely. Add your noodles into the bowl with the meat mix and season with fish sauce, salt, white pepper and stir. For the next part I usually use 2 large plates, (one with the lukewarm water and one for placing the finished rolls on) and a chopping board, with paper towel on the side to soak up excess water. Soften your rice papers in the water for about 30 seconds and place on the chopping board (if you leave them in any longer they tend to tear apart and it’s hard to seal them). Place a small spoonful of the mixture in the middle of the wrapper and wrap the rounded edge on the bottom, up over the mix. Then fold the both sides inwards over the mix edges and roll up into a cylinder. Place the roll onto a plate and continue stacking them on top of each other. In a large frying pan heat enough oil so that it’s about 1cm in height on a medium heat (wait until it starts to sizzle). Fry the spring rolls for about 10 minutes or until golden brown and crisp, but place them apart so they don’t stick (be careful with the oil, I usually place a splash gauze over the pan). Drain the rolls on a paper towel and serve with dipping sauce. Place the fish sauce, vinegar, sugar and water in a small dish and stir to dissolve the sugar. Add garlic and lime juice, and stir to combine (add chilies if you so wish). Enjoy with your crispy rolls!